Technically, this is my second make of 2014. I haven’t gotten decent photos of make #1. I keep trying to find a decent tunic pattern, but still no luck. 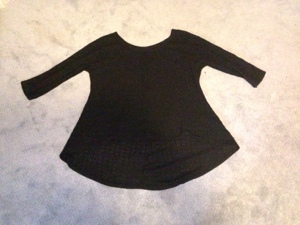 This is a swingy top from V8952 (view B) in a cheap sweatknit. It’s black so it photographs like crap. 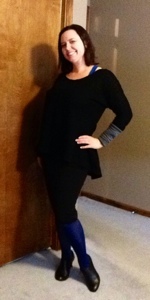 The back length is great, but the front length stops just a little short to be a good legging-tunic. I do like the neckline, but that’s where the like stops. Let’s be frank, I look pregnant in it. Sigh. Just a little too swingy for my full bosom. For work I styled it with a scarf (not shown), so combined with the black, it wasn’t overly preggo-looking. I’ll hold on to it for a bit but it won’t see high rotation. And what was make #1? Well, I’ll give you a hint, it’s inspired by these pants.